Last year we tried to visit this garden already, but it was exceptionally closed. This year we had some more luck and enjoyed a nice visit (including some crêpes) to this quite large garden. Although some parts of the garden are really stunningly beautiful, some other parts could do with some more maintenance. That said, this garden is surely worth a visit and will keep you busy for a while. Actually this garden is more a collection of different gardens on a discovery trail. The domaine is dotted with old barns, workshops and other little structures, carefully renovated and saved by the owner. Walking around the garden it is hard to imagine they only started the garden in 1994. It will take me too long to describe every part of the garden, so I will stick to some of my favorite parts. 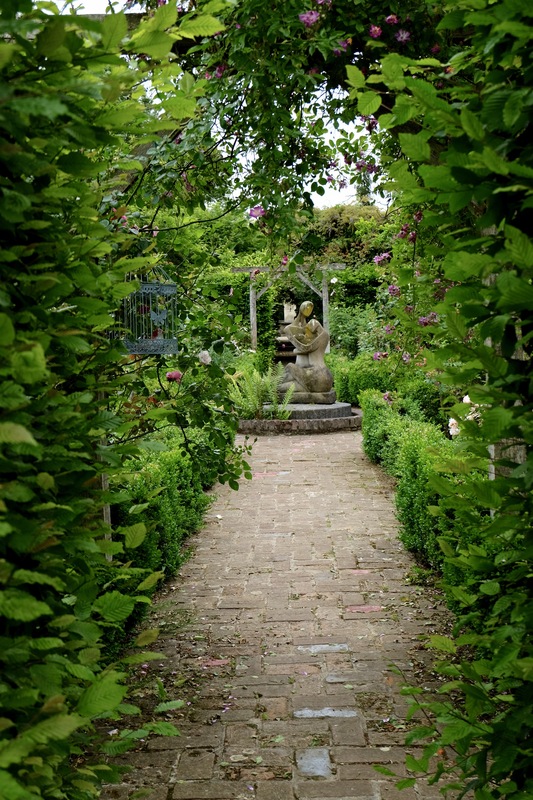 One of the first smaller and intimate gardens is the Moon Garden. The moon, symbolized by a round water feature, is surrounded with flowers in purple and white. The flowers all a bit higher up so you can get close to admire them. When you continue through the viburnum alley you’ll reach the perfumed garden. This garden is not the prettiest, but real fun, as you can touch the leaves of the different plants with all different smells. Ever smelled a geranium with Coca Cola parfum ? Well here is your chance. From here you go up a woody hill, which is a very inspiring part if you are looking for plants that grow in shade. Most plants have tags, so you can take note and use the information in your own garden. On top of the hill you have a very nice panoramic overview of the garden and the large pond. Closer to the main building you will find some lovely enclosed gardens. In the love garden you can admire an abundance of delphiniums, combined with roses. A feast for the eye and the nose. Passing the secret watergarden, with its square pond, you’ll find yourself in a small kitchen garden where different herbs play the main role. The Angels garden and Devils garden have plants that symbolize virtue or evil…another way of looking at plants. When you arrive at the big fountain, you turn right and enter the mixed border zone. Inspired by the English cottage flower beds this zone has something to offer from spring to late summer. Back at the entrance we were a bit hungry and tried out the savory crêpes and left with a satisfied feeling.